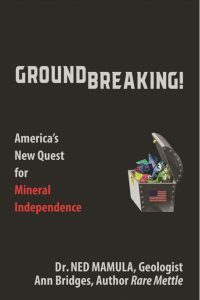 What happens when a geologist and an author whose chief interest is California’s Silicon Valley get together to take a look at the United States’ dependence on foreign supplies of critical minerals? The result is a long hard look at how our southern neighbour failed to take advantage of its mineral resources. Instead the authors say that the reliance on foreign supply has created a national security issue. There are separate chapters on rare earths, the American uranium debacle, and the Pebble gold mine in Alaska. If our readers wish to contact Ned Mamula, they may do so at [email protected] or 540-454-3057. He is the adjunct scholar in geosciences at the Centre for the Study of Science, Cato Institute in Washington, DC.